to lead the Colonels into 2014 play. EDWARDSVILLE – Wilkes University football ushers in a new era in 2014 as head coach Trey Brown leads a talented and deep Colonel squad into Middle Atlantic Conference play. With a league that leaves no easy week of competition, Wilkes will have to rely on the experience it received last year and a gifted freshmen class to weave its way through the schedule. “I could not be happier by the way we are competing in camp and the energy the guys have brought every day,” Brown said. “We have been treating everything as a competition, from getting to practice, to drills, to even getting to the dining hall, everyone has bought into the mentality we want this football team to play with,” he added. Brown takes over a Wilkes squad that finished 4-6 overall a season ago and 3-6 in MAC play. Of the six losses, four came within one touchdown from being a different outcome as Wilkes played in several back-and-forth affairs that came up a bit short. With a bulk of the defense returning and some talented playmakers back on offense, Brown hopes the new system that he has put in place will benefit the personnel of the Colonels. “We gave the guys a taste of the way we want to play offense and defense in the spring, and have just ratcheted it up a notch in camp the past two weeks,” Brown explained. Brown is no stranger to putting up big offensive numbers and limiting opponents on defense. While at Muhlenberg, the Mules averaged over 34.3 points per-game while allowing just 14.5 points per-game this past season when Brown served as offensive coordinator. He hopes to bring the same production to Wilkes in his first season at the helm of the tradition-rich program. The offense will undergo the biggest change with the addition of Brown and his high-octane spread attack. Wilkes figures to put the ball in the air a little more than in the past as well as keep its patented ground game keeping opposing defenses on edge. “Our offense will be explosive both on the ground and in the air with a balance to keep teams guessing,” Brown stated. “We have talent at different areas that will help us move the ball in short, middle and long distance situations,” he added. One of the most inexperienced spots in the offense, Wilkes will have to grow game-by-game under center after graduating Tyler Bernsten and Alex George who both saw time as signal caller the past four seasons. Sophomore Ryan Dailey has emerged as the top candidate to manage the offense this season. Although inexperienced, not having taken a college snap, Dailey has impressed with his decision-making skills and athleticism during camp. “I am confident that Ryan can make the right decisions because he has grasped the playbook very well over the spring and into camp,” Brown said. Senior Pat Cook and sophomore Marcellus Hayes add depth to the quarterback position throughout camp. Cook converted back to quarterback this year after playing on the defensive side a year ago. Hayes possesses a multi-dimensional run/pass threat which can flourish under the tutelage of Brown and the Colonel offensive scheme. Wilkes will look to improve on the 148.1 yards passing per-game last season with different approaches and style of offense this year. The run game will continue to be the cornerstone of the offense after averaging 171.9 yards per-game last season. Depth is the key to this position as Wilkes welcomes back three players from last year. Senior Ryan Behrmann leads the list of returners at tailback after playing wide receiver a season ago. Behrmann can run and catch the ball out of the backfield as proven by his eight catches and 79 yards last season as a slot receiver. The position change should make Behrmann flourish given his athletic skills and toughness. “Ryan is a tough kid, runs the ball with a passion, and is hard to bring down,” Brown stated. Sophomore Paul Martin is back after an injury cut short his season last year. Martin rushed 23 times for 81 yards and three touchdowns, all coming in the Colonels opening win against Morrisville a year ago. Junior PJ Incremona adds more depth to an already talented position after rushing 20 times for 80 yards as a sophomore. “Although Paul has been struggling through some small injuries, he is still a proven back that runs hard and can get yards after contact in this league,” Brown said. Sophomore Jacob Brook and freshman All-State performer Dustin Jones will also vie for time in the backfield for Wilkes. At fullback, preseason All-American and Second Team All-Freedom performer Nick Dawson will again lead the Colonel running backs with his punishing lead blocking as well as being more of a threat catching the ball out of the backfield this season. With the passing game set to be a high priority in the Colonel offense this season, its fortunate that Wilkes is the most experienced at the wide receiver and tight end positions. All three top receivers are back along with two returning tight ends which should make moving the chains that much easier. Senior Jon Conklin figures to be the Colonels top deep threat after hauling in 20 catches for 286 yards and three touchdowns last season. Conklin’s speed and agility sets him apart from teams’ secondary. Fellow senior Tim Bousson returns for his final campaign after missing last year with an injury. Two years ago Bousson made 11 catches for 166 yards. William Deemer has emerged as the third receiver in the group after a solid preseason camp. The sophomore saw time on special teams last season but used his speed to find a spot in the slot for Brown’s offense. “All three of these guys can have a special year for us and they will be featured in our passing game,” Brown commented. Freshman Ryan Richards is also vying for time on the outside for Wilkes. Senior Drew Devitt and Ryan Casey are back to solidify the tight end position for Wilkes in 2014. Both players can block and catch which fits in Brown’s offensive scheme. Devitt finished with nine catches for 142 yards and one touchdown, while Casey made six catches for 108 yards and one score last year. Senior Jeremy Hartman, who played on the Wilkes men’s basketball team this past winter, will also join Devitt and Casey at tight end. Hartman’s athleticism and good hands make him a special playmaker for Wilkes this year. “Jeremy is a dynamic athlete who can lineup in multiple spots for us including the wildcat, out of the backfield and on the outside,” Brown said. “With the group of Devitt, Casey and Hartman, tight end is one of the strongest positions for us heading into the season,” he added. The offensive line graduated three of its five starters, but returns two two-year starters in senior guards Joe Lane and Mike Litwak. Both Litwak and Lane will look to lead a young, but physical offensive line in 2014 combining for 13 starts last season. Sophomore Ryan Dupree looks poised to take over the center position after playing in seven games earning one start last season. Sophomore Myles Webb converts from his defensive line position last year to tackle this season bringing excellent footwork and strength to the spot. Freshman Alex Hollingshead has earned the other tackle spot thanks to his size and strength and will look to protect the Colonels’ quarterback’s right side. Cliff Francis, Lucas Amarose, Jake Schannauer and All-State freshman Kyle Stearley will add depth to the Colonel line. The defense returns nine starters from a group that forced 23 turnovers (nine interceptions/14 fumble recoveries) a year ago. With more of a multiple look this season, the Wilkes defense will pride itself on pressure, pressure, pressure. The front seven is almost intact from a season ago and will be looked upon to provide a run stop and even more pressure on the quarterback in 2014. “There’s a lot of flexibility in the front of our defense with multiple starters back,” Brown explained. “We will put our best 11 out there and try to make opposing offenses uncomfortable,” he added. The secondary is also intact from last year and will look to keep big plays from happening deep in the Colonels zone. Both tackles are back as seniors Jon Koslop and Jeff Lee anchor the middle of Wilkes’ defense. Koslop, an All-Freedom Honorable Mention in 2013, finished with 13 tackles, two sacks, and a forced fumble last season while Lee posted 26 tackles. The defenses big play ability will again come from its bookends as Jason Ugwu and Tyler Thomas return to cause havoc in opposing backfields. Thomas finished with 20 tackles (2.5 tackles-for-loss) while Ugwu posted 19 tackles (6.5 tackles-for-loss). Both possess endless motors and quickness that is unparallel in the MAC at the defensive end position. Sophomore Michael Fitz is also back and can play both the tackle and end position in the Colonel lineup. Fitz finished a stellar rookie season with 33 tackles (6.0 tackles-for-loss), two sacks and one forced fumble. David Wilke, Domminick Ammirato and Brandon Petrouskie will all add depth to a rotating door on the front four. Wilkes prides itself on its rich history of linebackers over the years and the graduation of four-time All-MAC linebacker Tate Moore-Jacobs and DJ Shuttleworth put an end to the recent era of greats. Coach Brown is still optimistic about the young players who waited their turn in hopes to surprise the league in 2014. “With the loss of two great All-MAC linebackers, most people would think we may be down this year at that position, but the young guys who have waited their turn for time are playing as well as any position on our defense right now,” Brown said. Sophomore Michael Condrad saw limited time last year as a rookie but has impressed all through camp. He finished with five tackles last season seeing the field in nine games. Condrad looks to replace the hole left by Moore-Jacobs. Tanner Geake is another sophomore poised on making an impact in his first season as a starter after finishing with four tackles last year. 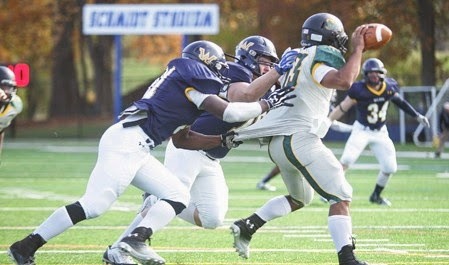 Senior Nick Gray and sophomore Mike Paskas will man the outside linebacker position for Wilkes going forward. Gray posted 31 tackles in ten games last season while Paskas added 41 stops and two fumble recoveries before an injury caused him to miss the final three games of the year. After two years of growing pains in the back of the Wilkes defense, the Colonel secondary is the strongest and most experienced its been in recent time. Both corners and both safeties are back which will allow Wilkes to play different styles and schemes in the back. Preseason All-American and Second Team All-MAC performer Omar Richardson leads the list of returners after finishing with 59 tackles, two sacks and two interceptions last season. He took his one pick-off 78 yards for a score in the Colonels win at FDU-Florham. Richardson was tested throughout the season passing each exam on way to five pass break-ups. On the other side will be junior Jared Powell who moves up from his safety position from a year ago. Powell’s physical style of play will benefit the Colonels on the outside. He finished with 29 tackles and one interception last year. Junior Marcus Leaf swaps from corner to safety thanks to his rangy athleticism and size. Leaf was also tested on the outside last year finishing with 54 tackles and six pass break-ups. Senior JT Keer, the Colonels top tackler back from last year, will man the other safety position. Keer posted 64 tackles, one interception and four pass break-ups last year in his first season as a full-time starter. Other players looking to add depth to the secondary include Ondre Roberts and Jeff Mastrantuono, both at the corner position. Wilkes will have to replace kicker/punt Jordan Fredo after graduation this season. The punting seems to be solid as Bryan Mellon returns ready to step into the starting punters roll. It has been a revolving door at the kicker spot as Behrmann, Stephen Brundage, Hayes and Mastrantuono have all ventured in the spot. The Colonels will also look for a new kickoff specialist out of the group. - Wilkes will not have to worry about being away from home early this season as four of the Colonels first five games are at Schmidt Stadium including the opener on September 6 against Muhlenberg. - Homecoming is set for Saturday, September 27 against Lycoming College. Wilkes will host “Share the Spirit” event in which all lettermen and letterwomen will be honored along with a guest appearance by Wilkes graduate and Wisconsin men’s basketball head coach Bo Ryan. - The annual Mayor’s Cup game against cross-town rival King’s is scheduled for the season finaleSaturday, November 15 at Schmidt Stadium. - ESPN Williamsport (1050 AM, 104.1 FM), now in its fifth year partnering with Wilkes, will be the official voice of Colonel Football over the radio at all home and away contests.